Over-the-Top Despicable Me Family Costumes - Entirely Homemade! 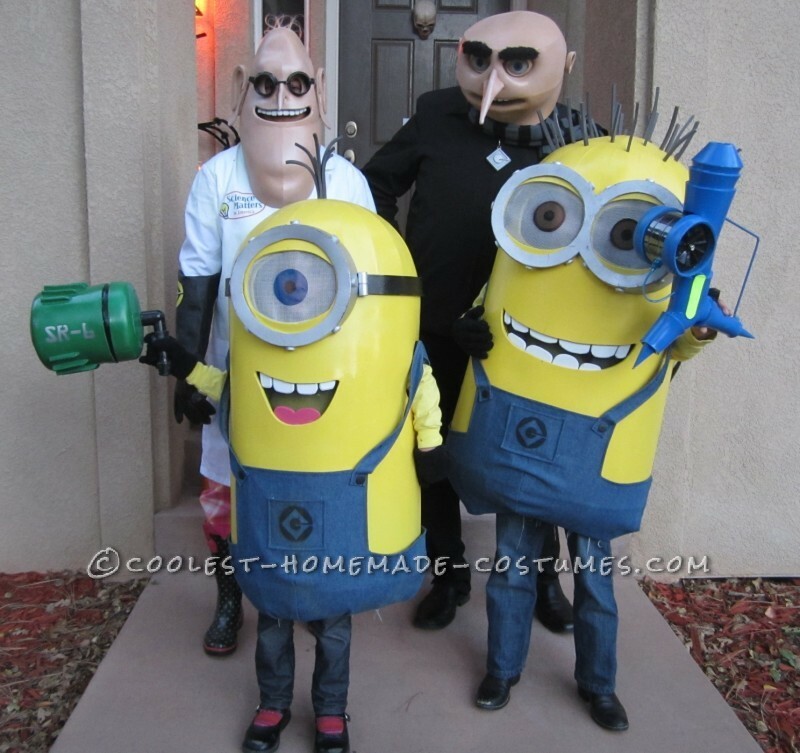 Over-the-Top Despicable Me Family Costumes – Entirely Homemade! Every year we go pretty overboard on Halloween costumes. 2013 one was no different. After much discussion we decided to do a family theme with Despicable Me. 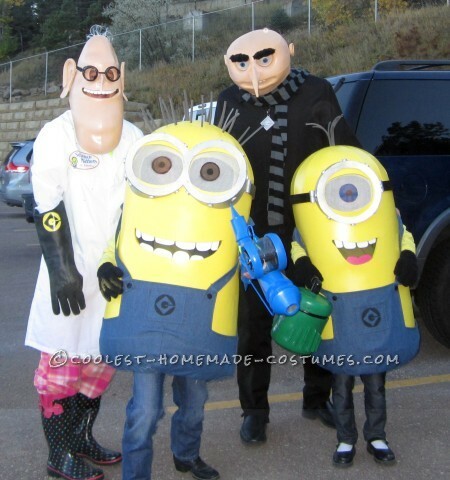 Dad (me) would be Gru, my wife would be the super cool Dr. Nefario, and the kids, of course, my Minions. I know, Minions were very popular this year, good in that our costumes were very popular at all the events, but bad for costume contests, given the number of Minions I’ve seen on these pages. However, I haven’t seen too many Gru heads, and even fewer Dr. Nefarios, so here it goes…. We started thinking about costumes before Despicable Me 2 came out in July, hence no Lucy. Everyone asked why my wife didn’t dress up as Lucy. I think Dr. Nefario is way more funny anyway. Actual designing and building started in August. We usually have events up to 3 weeks before Halloween, so we need to start early. 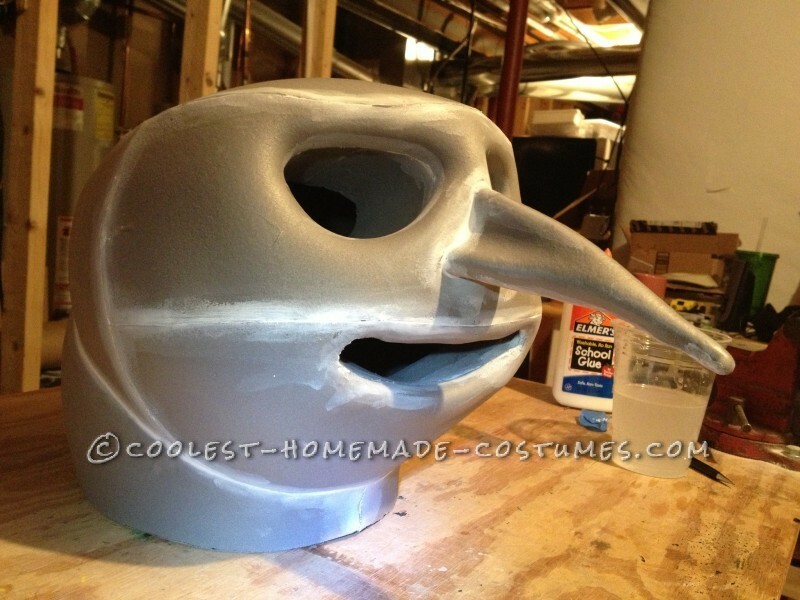 In the past, I have built a lot of costumes with relatively stiff foam board. It’s great to work with, but it is not too comfortable to wear and doesn’t do curves well, and these costumes were going to have a lot of compound curves. 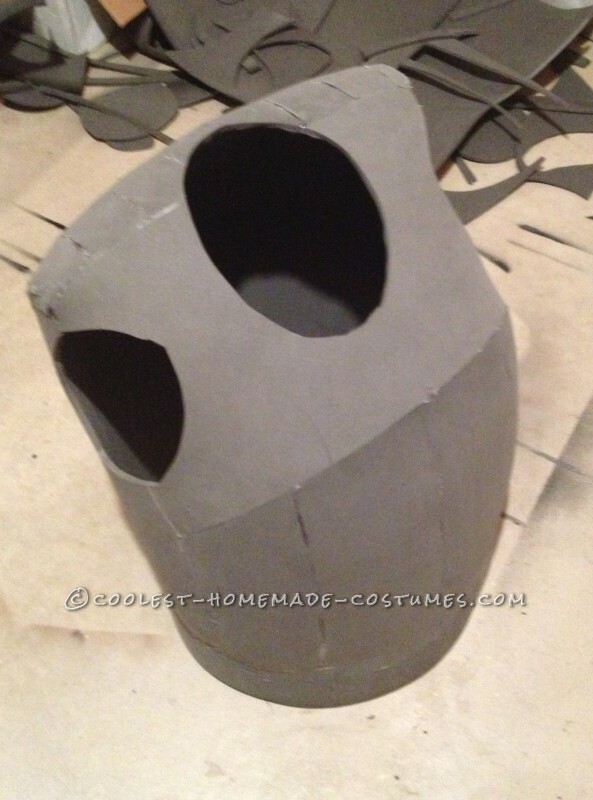 So I opted to make them out of flexible EVA closed cell foam. I did a Bumblebee mask for my son last year out of heavy duty thick EVA foam (gym floor mat material), this year I stocked up on 1/4 “ thick sheets from a supplier in California. 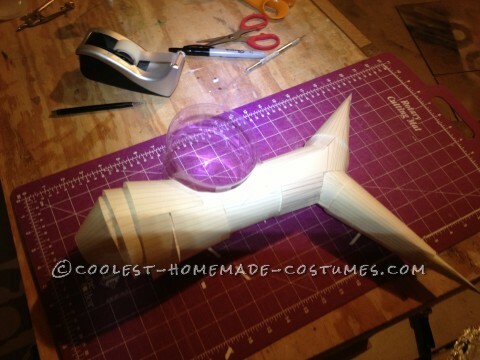 It took me a while to get the hang of it, but EVA foam is really cool stuff. 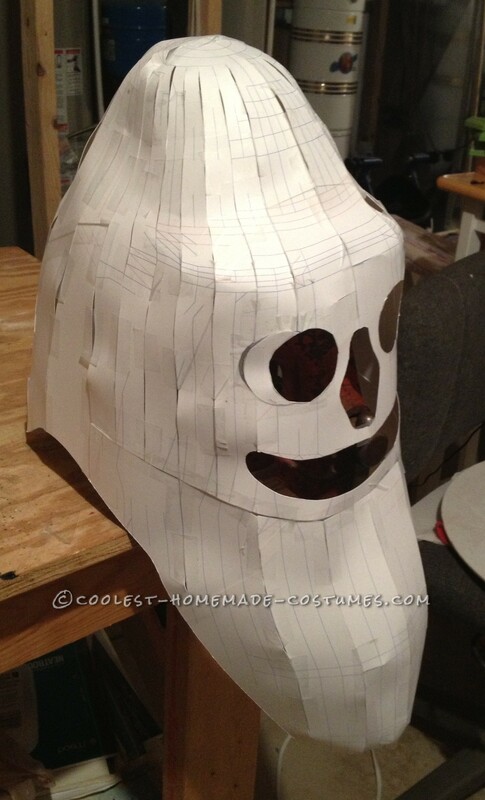 It cuts easily, creates strong joints with hot glue, and you can heat it up with a hot air gun and form it into shapes. A little caulk and white glue plastered on the surface then allows you to spray paint it nicely. The hardest part is getting it into just the right shape. Just in case I ran out of time, I started with the Minions (also the easiest shapes), and then worked my way up to Nefario’s funky shaped head (which was a challenge). The costume foam elements were: the Minions, Gru’s head, Gru’s body (so I would look hunch-backed), Nefario’s head, the Shrink Ray, and the Freeze Ray. Each went through the same basic process. Now, I’m an engineer, so measurements and drawings came first. First I sketched out 2D drawings in Visio, pulling images from the web and tracing contours to get the right proportions. I then scaled the 2D sketches to fit my kids, or my head, or my wife’s head. Once I was happy with the sizing, I went to create 3D models in CAD (remember, I’m an engineer….). 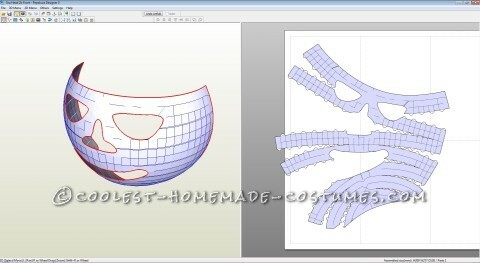 That let me create 3D surfaces which I could import into Pepakura Designer paper folding software. Pepakura is software that takes complex 3D surfaces and creates 2-D cut templates that when printed on card stock, folded and taped up, recreate the 3D shapes. I prototyped most of the costume elements in paper first, which was fast, which also allowed me to test fit the elements on the subject; especially the Gru and Nefario masks. Then I went about shaping the EVA foam into rough shapes and cut it to size using the paper templates as a guide. I glued all the foam pieces together with hot glue, and then slathered caulk and white glue to protect the foam from the spray paint. Simple, right? For the Minions, I used painted window screens for the eyeballs, so the kids could see out of the costumes. Sewed denim fabric was used for the overalls. Purchased long sleeved yellow shirts and black gloves completed the Minions. For Gru, window screens were also used for the eyeballs, and fabric fur for the eyebrows. I got an oversize black jacket from a thrift shop for Gru’s body, and cut out Gru’s zipper medallion out of balsa wood. 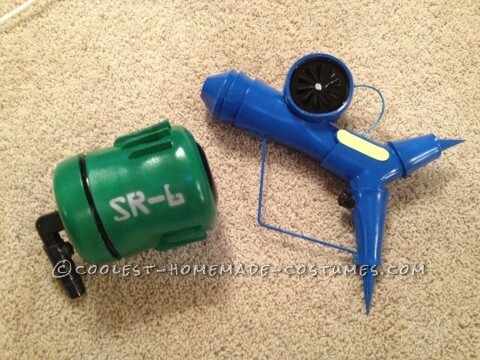 The Freeze Ray and Shrink Ray were also embellished with LED flashlights from the dollar store so they would light up at night. Note that the Freeze Ray is pretty true to the movie design, but I had to truncate the Shrink Ray so my Minions could wield it. After more hours than I would like to admit (easily 80+), we were ready for our first Halloween events. Despite starting early, I was still up painting into the wee hours the night before. We had several private Halloween parties to go to, and our favorite event, Boo at the Zoo. The hard work paid off. The response was awesome. We won a couple contests and we had people lined up 6 deep to get pictures with us at the zoo. Kids loved them, and my kids (and us old folks) had a blast. We did have a brief Minion meltdown with my 6 year old on Halloween night. My poor daughter was upset that she couldn’t run ahead with her friends. 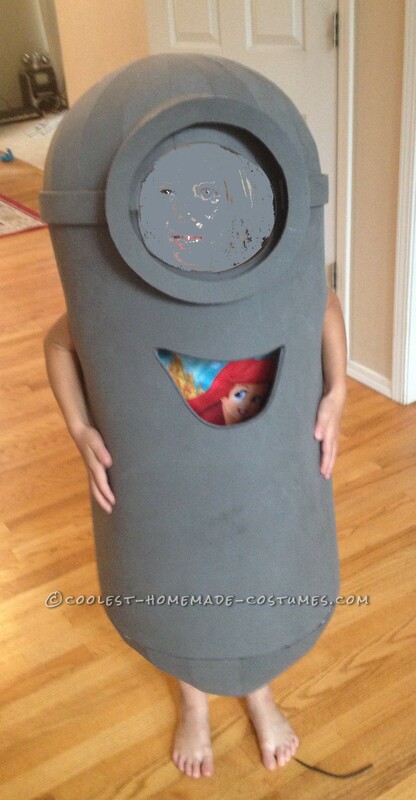 It was really hard not to laugh while she stomped around waving her arms madly… in Minion costume. This is Awesome!!! Even better because it’s from my home town!! !Great work!! The best I’ve seen. Kudos! 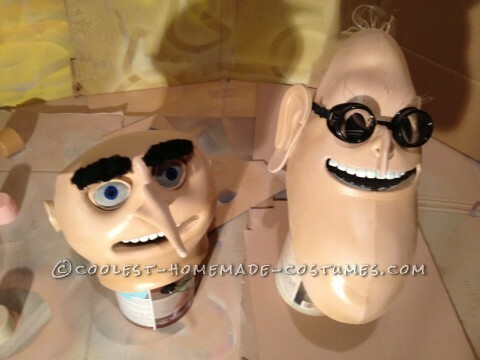 I wanted to know if I can purchase the costumes, especially dr nefario and Gru. I just finished making mine out of paper mâché and it came out horrible. Unfortunately I don’t have time to make another one and we are dressing up this Friday as a family and I would have to disappoint my kids.